MEPC Wellington Place is now offering free bike hire to all Wellington Place employees. We hope that cycling offers a convenient, cost-effective and most of all, environmentally-friendly mode of transport for employees at Wellington Place and we are keen to do all we can to promote the benefits. There are 7 bikes stored behind 1 Wellington Place, including an electric bike, which can be hired by Wellington Place employees for free using the App-Bike app. To download the app click here. Bikes can be reserved up to 3 hours prior to when you want to use them, or you can hire them immediately. Sign up using your work email address to verify that you are a Wellington Place employee. Select ‘Wellington Place member’ for the payment option in the app. You will not be charged for renting the bikes, however credit/debit card details are required to cover repair costs in cases of misuse or damage during use. Click here to view App-Bike’s terms and conditions. Click on the location pin for Wellington Place to see available bikes. To start using the bike, scan the QR code on the bike you want to use. Tap the lock image to unlock the bike, and then you are ready to go! Please test the brakes, lights, tyres are all working, and adjust the saddle before riding. A pannier, high vis vest and waterproof cover are included with the bike hire. Helmets are not included, and although they are not essential, we would highly recommend that you wear one. You can purchase a helmet for £25 (we can only accept cash email info@wellingtonplace.co.uk). 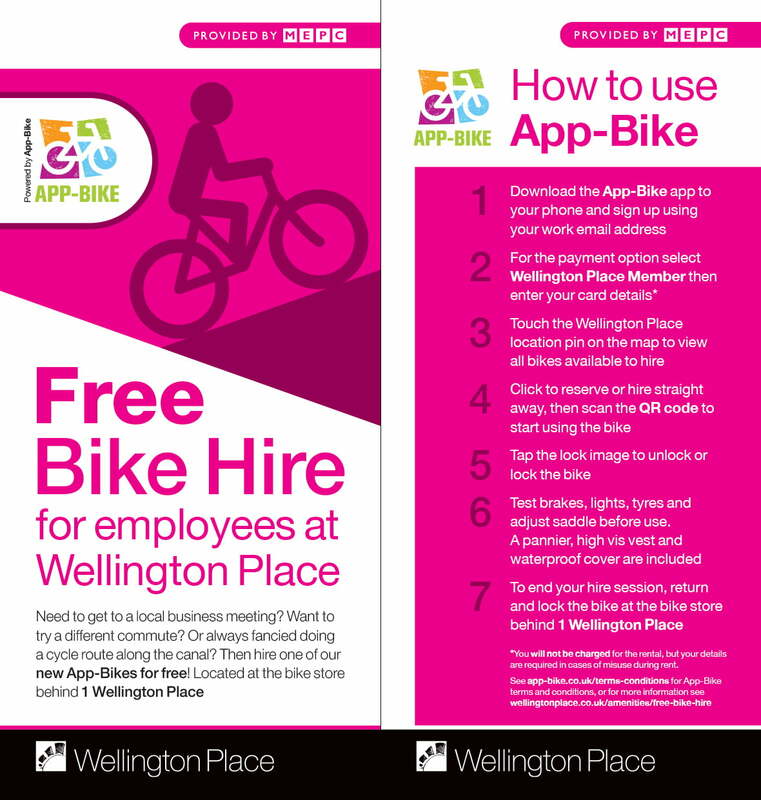 Click here to see the Wellington Place App-Bike Leaflet. Click here to watch the App-Bike tutorial video. If you experience any issues while using the bikes, please contact App-Bike customer support directly on 01892320270. If you want to use the electric bike and the remaining charge on the battery means the range is less than how far you intend to go, please contact the security team on 0113 246 8399 or visit them at 3 Wellington Place (during office hours only). They will swap the battery for one that is fully charged. You can check the range of the battery by activating the onboard screen and clicking through the options. These bikes are ideal for attending meetings in other areas of the city or for a lunchtime cycle along the tarmacked Leeds & Liverpool canal towpath. There are a number of on- and off-road cycle routes leading to Wellington Place including the Cycle Superhighway, Whitehall Road and the canal tow path. The electric bike will extend the distance you would usually ride and can give more assistance on hills if you choose. Plan your cycle journey here. The West Yorkshire Cycle Map is available here and includes all the cycle routes around Wellington Place.